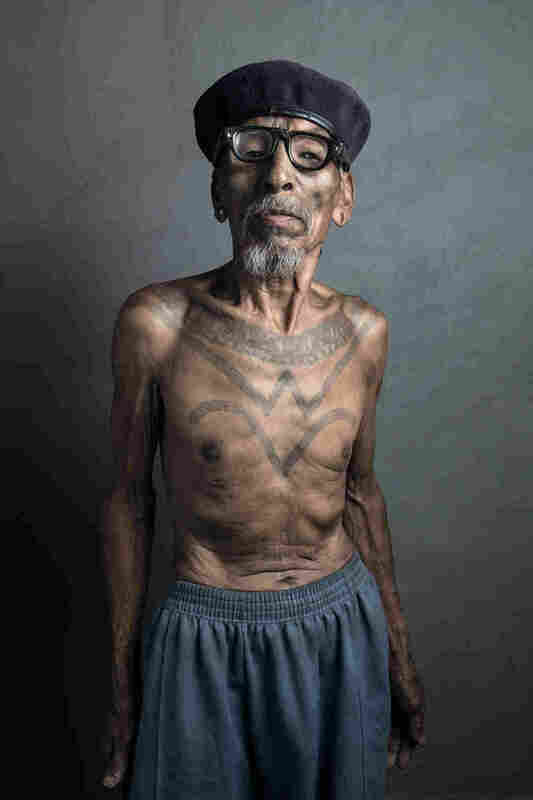 PHOTOS: Book Looks At The Tattoos Of A Tribe Of Former Headhunters : Goats and Soda The tattoos were once a sign that a man in India's Konyak clan was a headhunter. A new book tells their story. Chingham Chatrahpa, 75, shows off his facial and neck tattoos. A face tattoo would be etched after a man's first headhunting expedition, usually at the age of 18-to-25 years. Only a warrior who decapitated an enemy could get a neck tattoo. When Phejin Konyak was a girl, she'd sit on her grandfather's lap in front of a roaring fireplace, with a pot of black tea simmering. He'd tell her folk tales. She was entranced by the stories — but even more by the jet black tattoos that curved over his eyes, nose, upper lip and chin. His neck, chest and body were filled with geometrical shapes and patterns. When she went to boarding school at age 4, she began to realize that her grandfather's tattooed body – and indeed, the tattooed bodies of his fellow tribesmen – were quite extraordinary. "All sorts of tribesmen would pass by our home or halt here for the night. All of them were elaborately decorated with tattoos. I always believed that tattooed bodies were the norm," she says. 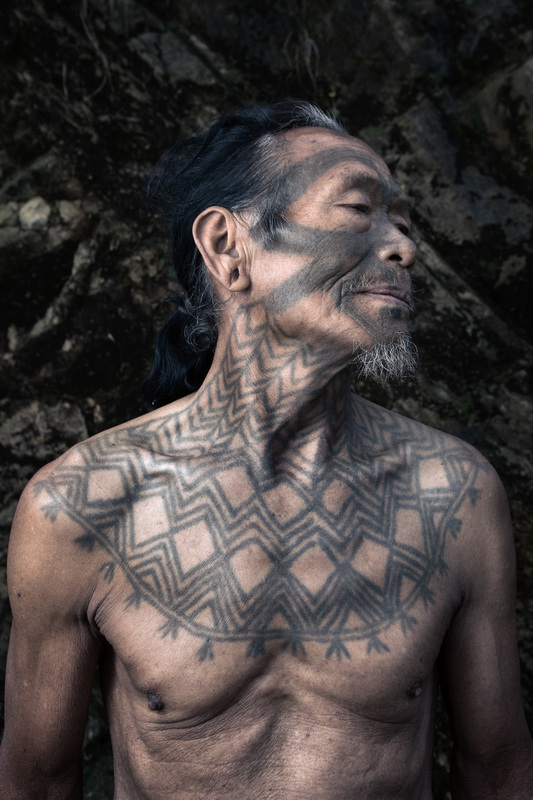 And now, Phejin has written a book, The Last Of The Tattooed Headhunters (Roli books), documenting the tattooing traditions and the headhunting rituals of her ancestors. She collaborated with photographer Peter Bos to explore the changing ways of life and culture of this warrior clan. The Konyaks are an ancient tribe, living in over 120 villages in India's North Eastern state of Nagaland, bordering Myanmar. Fiercely individualistic, they once believed in settling disputes by headhunting — decapitating their enemies. They also hunted the heads of animals — cows, wild boars and monkeys. "For hundreds of years, our people were completely isolated, even from mainland India," she says. And then, change and modernity swept through Konyak territory at an alarming pace. There were mass conversions to Christianity. "I don't deny that change is good, especially when it ushers in education, but in the case of the Konyaks it was too much, too soon," says Phejin. When she visited the National Museum of Kolkata in August 2014, she realized how much of India's rich cultural history was on display — and how there was barely any information about her own people. One reason, she says, is that people have been afraid to go into the territory of these fearsome warriors. "It struck me that even within India, the Konyak identity wasn't as well-known," says Phejin. "I knew our voices needed to be heard." The Konyaks were once warriors who believed that the human skull held magical powers. It was deemed the place where the Yaha or the soul resided. 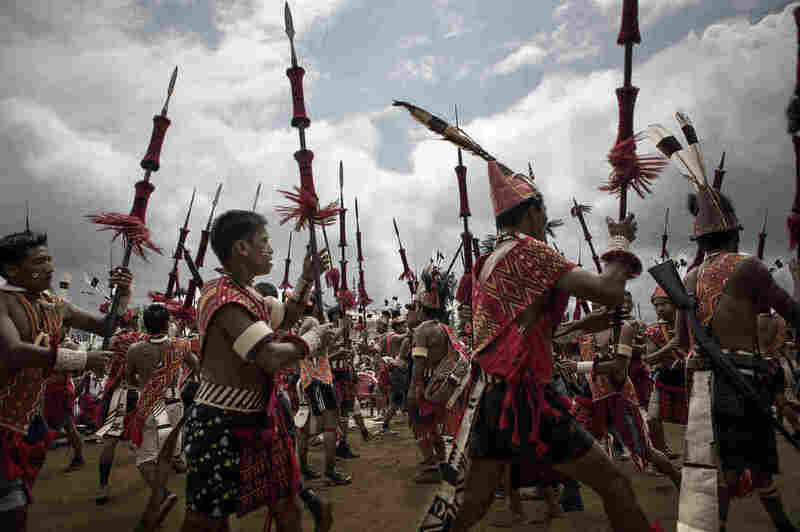 A Konyak warrior believed that if he captured a head, it would bring his tribe good fortune. And that's where the tattoos came in. A warrior who decapitated an enemy would be decorated with a prized neck tattoo. If he were only part of a larger hunting group and didn't actually cut the head of his prey, he would be given a facial tattoo. Rattan palm cane needles were bound into "tattoo combs" to etch the design, using the sap from the kong tree for the dark ink. In addition to the headhunting-related tattoos for men, the patterns were indicative of their clan and represented bravery, status and achievement. "For women and girls, tattoos marked a transition in their lives from one phase to the next," adds Phejin. Women also had special tattoos signifying the achievements of male members of their family. Today, the younger generation dresses in traditional clothes during festivals, but they paint their faces instead of undergoing the painful process of tattooing. Young Konyak men celebrate a festival. The younger generation prefers body paint to tattoos. In March 2015, Phejin met Peter Bos, a 46-year-old Netherlands-based portrait photographer. She asked him to help with her book, he readily agreed. They both invested from their personal funds to cover their research. "It was an intriguing project," says Bos. "I was always painfully aware that I could be the last to document the Konyaks. "I shot a picture of an old frail man who was standing outside his bamboo hut, with a bag of monkey skulls. Back home I printed the photo out and sent it to his family. By the time they'd received it, he had passed away." Seventy-five-year-old Chingham Chatrahpa lived in Chen Loishu village in a remote part of Mon district. "Our pick-up truck couldn't go on because of the bad roads and heavy rain. We hired a four-wheel drive that took us a bit further, but we had to cover the rest of the five miles on foot," says Bos. Chatrahpa refused to allow them to photograph him at first. "Thankfully, we were able to convince him," says Bos — partly because a Konyak woman was behind the project. Their photo of him is at the top of this post. In some of the photos in the book, it is evident how the changing times have affected the Konyaks. 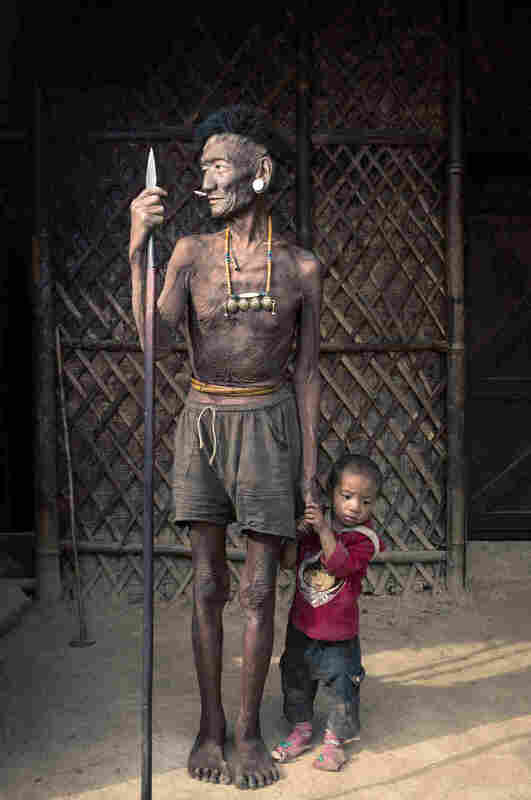 There is a picture of an old warrior posing with his grandchild, holding him close just outside their long house. The child is dressed in western clothes. The contrast, Bos says, caught his eye immediately. Another startling image is that of 82-year old Pennga of Hunphoi village. His chest tattoos were a stark contrast to his western clothing. "He wore old gym pants, a beret cap on his head and dark glasses," says Bos. "He posed for me with such confidence."